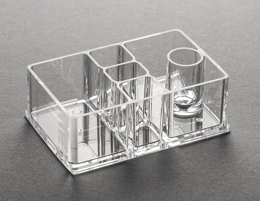 On-­chip Sort,­ the microfluidic chip cell sorter. Cells are sorted by “flow shift” in microchannels, avoiding sheer stresses, pressure changes, impacts, and strong electric fields which might damage or alter the cells. Because our sterilized microfluidic chips are disposable, cross-contamination between samples never occurs. 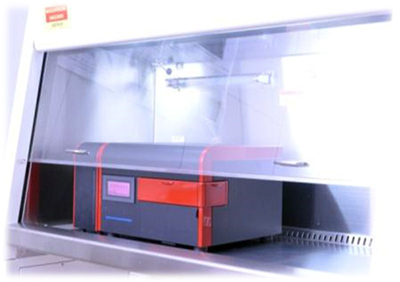 It is compact enough that it can fit inside a biosafety cabinet, with no generation of aerosols. This is an ideal solution for safe handling of biohazardous materials, where safety is paramount. Run the sort with your preferred buffer: culture media, sea water and even oil. Small sample volumes (~20 μL) can be analyzed without almost no dead volume. On­-chip Sort is the most suitable instrument for the analysis and sorting of precious samples. Maintenance of On­-Chip Sort is easy. Fluids never gets in contact with the instrument, so no cleanup is required. On­-chip Sort is easy to operate and does not require hours of training.